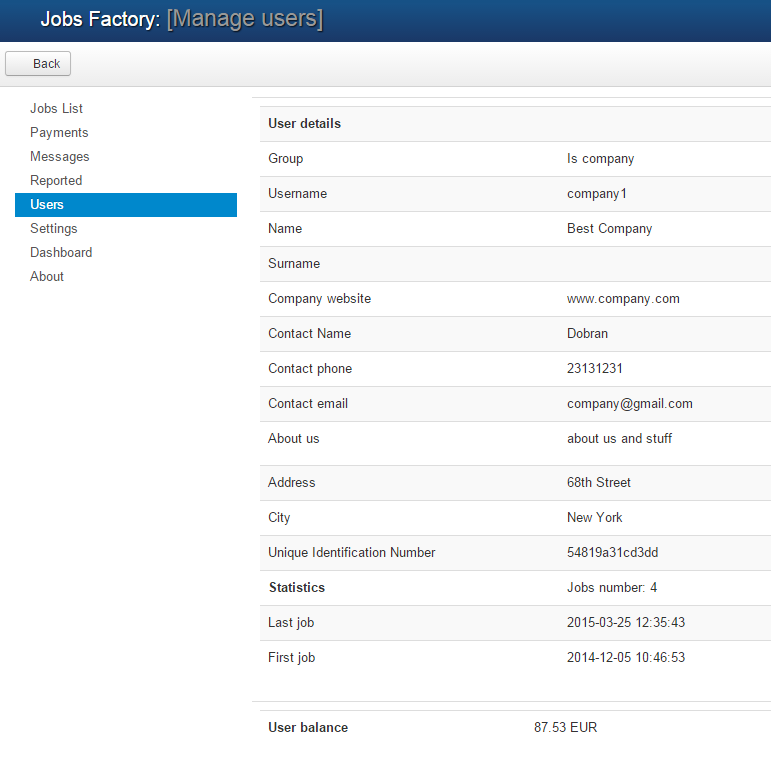 On Jobs Factory's backend, you can find the Users page which contains a list of basic user information and management tools. While the registration is handled by Joomla, once the user logs in for the first time, he will be prompted to choose from being either a Candidate or a Company within Jobs Factory and to fill in the Jobs profile in order to have access to all the features of the component. (You will have to first create the 2 groups, for more information check out this page) Without doing this, the user will be redirected to the profile filling page when attempting to access certain menu pages until said profile is filled. For example, when attempting to see the Applied List page. Viewing job offers does not require a user profile by default or even logging in. On Users page you can check their emails, names, statistics about the job offers along with their Status(company or candidate). You can also Block/Unlock, allowing you to ban that user from the Joomla Login and automatically denying him to apply on job offers. Users with Verified and Powerseller ranks can receive differential prices for the available payment items. These prices are set in the config of each payment plugin. Clicking on the name of a Company/Candidate will redirect you to the details page of the respective user. On the details page you can see personal details and statistics related to the user (including custom fields) along with the user balance and a unique identification number.